Do you know who has sent out the most National Hunt runners since January 1st 2013. Thats surprised me, my guess would have been David Pipe or Paul Nicholls, but they come in fourth and fifth behind Donald, Jonjo and Willie Mullins. So today I'm going to look at some Donald McCain stats, I don't know if they will lead us anywhere, but we'll see. The headline numbers for all National Hunt runs since January 1st 2013 are a loss of 30% on monies invested with a 16% strike rate. If we break that down by race type we can see that there isn't much difference in the ROI's although hurdles are the least profitable at SP. National Hunt Flat have the highest strike rate. For now I'm going to look more closely at the Hurdle races because there is more volume their to work with and the strike rate is better then the Chases. Breaking down the hurdle runs by track it seems that Donald will go anywhere for his runs with almost every course featuring in the last two years. This table shows just the ones where he's had more than 10 runs. Only Newcastle, Kelso and Musselburgh have a positive ROI, with Newcastle and Kelso very positive. When I look at Jockeys I see that Tony McCoy has a positive ROI again, despite the fact that so many mug punters bet everything he rides he still manages to outrun his odds, you'll remember it was the same with Nicky Henderson. Noel Fehily also has a very good strike rate, but from not many rides. Ok let's skip ahead a bit and see if we can put something together that is profitable for us to benchmark future McCain runners that we are considering betting. What I've done is to select all tracks where the strike rate was over 20%, I've then discounted the off season months and only looked at October to March. And I've excluded Heavy going. Which gives me a 29.4 % ROI at iSP and a 29% strike rate from 150 runs. Ayr, Bangor, Cartmel, Catterick, Kelso, Musselburgh, Newcastle, Sedgefield & Worcester. 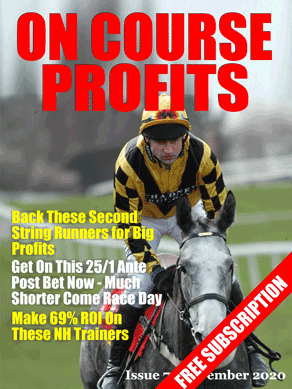 We can improve the ROI by only including Jason Maguire rides but then we will be below 100 bets since January 1st 2013.